Osvaldo Licini, Personaggio Olandese volante (Flying Dutchman Character), 1945, oil on canvas laid on panel, 9 x 11". “I segni dell’angelo” (“Signs of the Angel”) offers an unusual and valuable opportunity to retrace the rich, multifaceted creative trajectory of Osvaldo Licini, one of the most significant Italian artists working in the first half of the twentieth century. Around forty works lead viewers through various phases of the artist’s inimitable visual vocabulary, which conjoins abstraction and Surrealism, rationality and poetic invention, sign-laden constructions and chromatic emotions. The show begins with abstract works exhibited in the artist’s first solo show in Italy, at the Galleria del Milione in Milan in 1935, following a long sojourn in Paris where, beginning in 1917, Licini had associated with various members of the international avant-garde, most notably Amedeo Modigliani and Pablo Picasso. Seemingly aerial figures in asymmetrical, deliberately unstable compositions, in which a sense of balance seems fleeting, often take on symbolic connotations. During the early 1940s, these scenes of suspension transformed into a new approach of fantastical figuration, always based on lightness and instability, even while possessing counterpoints of bold chromaticity. 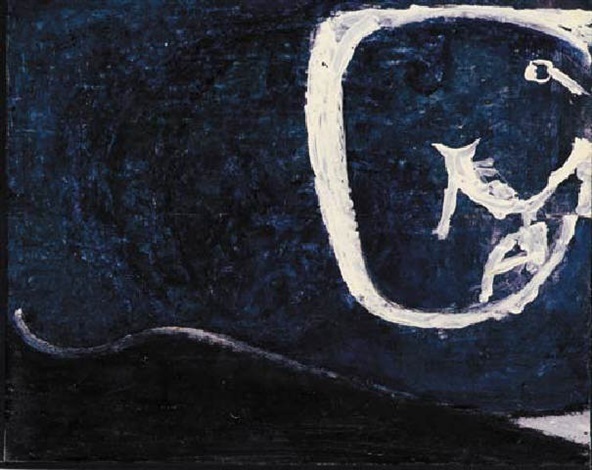 Licini’s world is populated by imaginary figures that seem to seep through a haze, appearing in (often nocturnal) skies above softly rendered horizons. They inhabit a realm both delineated with landscape elements and tinged with eroticism, traversed by moons, missiles, and ghostly vessels, sometimes punctuated with enigmatic letters and numbers. There are figures representing both Amalasuntha, the sixth-century Ostrogoth queen, and lunar symbols of regeneration flowering in her hands, eyes, hearts, and breasts—as well as Wagnerian Flying Dutchmen and rebel angels, both celestial and demonic, midway between ascent and fall. Along a path through the exhibition enhanced by a selection of wonderful works on paper, in which sinuous symbols cause the slender figures, held aloft, to throb with life, these quivering visions finally move visitors through time to 1958, the year of the artist’s death, only a few months after he won first prize for painting at the Venice Biennale.